I awoke early to go for a morning bird-watching walk with the amiable Keith around the camp. The electric elephant fence that ringed the camp had been partly destroyed in the night, and we could see elephant tracks and sloth bear tracks….and leopard tracks, fresh ones. To think just a minute’s walk from our tent all this animal traffic was passing by in the night. Back in the camp, Vero and I had a lovely breakfast around the pond, again just the two of us, the only guests in this large and luxurious campsite. Then it came to the ugly business of money with Da Silva. It took a while to work it all out, and we had to pay everything in cash in a mix of Sri Lankan rupees and dollars. We had just enough to pay everything. Then we hopped into a safari jeep and were taken to town, where we grabbed a hired car and driver arranged for us the night before to take us away from the sweltering heat and up into the cool mountains. 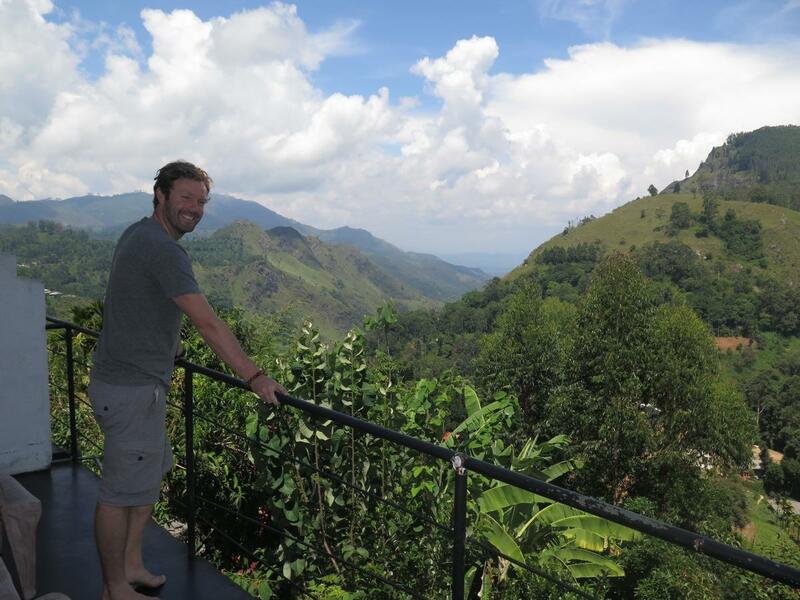 The drive to Ella, in the heart of Sri Lankan tea country, wound up and up the mountains, passing lush valleys, adrenaline pumping mountain passes, and impressive waterfalls. I last came here almost 8 years ago, and at that time stayed in the sleepy town. This time we were heading up and away from the town, to the place of mountain lodges and stellar valley views. We stopped outside a dirt track that led down to the place we’d booked, and a tuk-tuk came up to take us and our bags down the rest of the way to our bed and breakfast. We were staying at Ella Nature View Inn – a friendly, simple, cheap place, but with a view you’d happily pay a premium for. Each room commands a sweeping vista of the mountains and valleys, and the first thing I did upon checking in was to brew a cup of tea and sit on the massive balcony and just take in the spectacular view. You don’t get this in Ella town 10 minutes away down the hill. I spent some time here just taking it all in, watching the monkeys crawling on the balconies of the other bungalows, the birds in the trees, a train trundling by on the old railway line below and beyond. I couldn’t stay here all day, though I wanted to. We put on our walking shoes once more and headed down to the train tracks. It was as stunning now as I remembered it 8 years ago, when I wrote in a story you can find on this very website “Huge green hills all around, and I could see the silver glimmer of a waterfall, like thousands of silver fish dropping down the mountain, and I could here the subdued rush even from afar. I could see the tea fields all the way up the mountains, make out tiny wooden houses here and there, dwarfed by nature. I don’t think I’ve ever seen such beautiful views…” We wandered down the train track, and I noticed some enterprising locals have set up wooden houses along the route which are cafes or small restaurants, which I don’t remember from 8 years ago. Families smiled and waved as we walked past. Local schoolchildren in smart uniforms carrying books skipped along the tracks to get back to their home in some distant village, farm hands carrying sacks of goods walked down the other way towards town…..but it was a rare sight to see anybody on this stretch of track, and it was a lovely peaceful walk in the fresh mountain air. To think only a few hours ago we were in a hot, dry, national park with elephants, crocodiles and leopards, and the day before that on a glorious beach from which you could go whale and dolphin watching. Sri Lanka’s diversity is fascinating for such a small island. Vero and I didn’t make it too far – the adventure to Ella Rock I’d made 8 years ago was not to be repeated today. We turned and headed to town, walking all the way along the train track until we reached the centre. Ella town is chaotic, much more so than I remembered, and a glut of unappealing guest houses and some newer monstrous hotels built for huge tour groups have made it quite unsightly. We went to Cafe Chill for a delicious lunch and a beer. This cavernous mult-roomed place is probably the hippest place in Ella, and is full of travellers lazing around swapping tales of their adventures….it’s the place to be in Ella, and has this very complimentart write up in the Lonely Planet: “Run by an engaging local team, this huge, stylish roadside cafe-bar-restaurant goes from strength to strength. Its latest addition is an upper deck scattered with cushions and tables that’s graced with a sculpted, wave-inspired wooden roof. Background music is modern and carefully selected. Oh, and the food is excellent too, with flavoursome local and Western dishes and espresso coffee.” We enjoyed our meal while the TV in the background played one of those ‘When disaster strikes’ trash TV shows, which seemed to show a lot of people getting killed in rockfalls, avalanches, kayaking accidents etc. Hardly appetising, but the waiters seemed to be intrigued. We walked off the meal around the town, reaching the train station, and took in a game of cricket, a national obsession here in Sri Lanka of course. Despite the chaos, there is one place I remembered visiting the last time, and I wondered if it was still around…..I walked with Veronica to a place just on the outskirts of Ella, to a large house that is now a hotel, and through the lobby to the garden and the view I had enjoyed once before. It was called Ella Rock View back then, but now has been taken over by the Government and has a different name. It’s the same though. An incredible view. A lovely lawn, tables and chairs. Friendly staff. We were the only ones there. We enjoyed a pot of tea, served by a waiter dressed impeccably in a white suit, and the view of Ella Rock as darkness fell was magnificent. We saw a Ruddy Mongoose, endemic to Sri Lanka (and India) in the garden, and it ran into the kitchen. It was on the prowl, and we called over the waiter to warn him, as mongooses are vicious little things and they can cause quite a few problems if they get into kitchens. The waiter laughed. Oh, you mean Pradesh? He’s the resident mongoose. He comes at the same time everyday because we give him chicken bones. We went to the little garden at the back of the kitchen and sure enough, there was Pradesh, sharp little teeth crunching away at chicken bones, reddish eyes watering with happiness. He seemed oblivious to us standing there watching him. After some time, Pradesh lurched into the undergrowth and was gone.